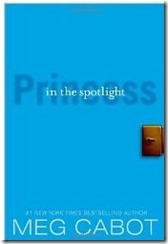 Volume 2 of the Princess Diaries series, Princess in the Spotlight, starts up with some really big news, another huge life event that Mia has to get used to. I won’t tell you what it is but I’ll tell you this much: Mia takes the news a lot better than she did when she first found out she was a princess. On the royal side, Mia is getting ready for her first big interview with Beverly Bellerieve on the prime time news show, “Twenty Four/Seven.” Unfortunately the interview doesn’t go very well. Mia ends up blurting out all sorts of information that makes life rather difficult for her. Besides the interview there’s plenty of other fun things going on in the book. There’s sleepovers and weddings AND Mia starts getting notes from a secret admirer! He’s someone who professes to like Mia well before she became a princess. I know who you’re thinking…I thought it was that same person as well when I read the book the first time. I won’t spoil it for you now, but you better hurry up and read it because I’m going to break open this whole thing when I talk about book 3, Princess in Love. There’s no question about the rating, of course. It get’s a Shrimp Coma Mrs. B all the way.